Rene Descartes (1596-1650) was a French philosopher, mathematician, and writer who spent most of his life in the Dutch Republic. He has been dubbed The Father of Modern Philosophy, and much subsequent Western philosophy is a response to his writings, which are studied closely to this day. In particular, his Meditations on First Philosophy continue to be a standard text at most university philosophy departments. 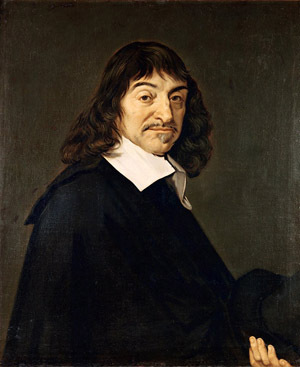 Descartes' influence in mathematics is equally apparent; the Cartesian coordinate system -- allowing reference to a point in space as a set of numbers, and allowing algebraic equations to be expressed as geometric shapes in a two-dimensional coordinate system -- and conversely, shapes to be described as equations -- was named after him. He is credited as the father of analytical geometry, the bridge between algebra and geometry, crucial to the discovery of infinitesimal calculus and analysis. Descartes was also one of the key figures in the scientific revolution and has been described as an example of genius. Rene Descartes was born in a village near Tours in France in 1596. At the age of eight years he entered the Jesuit College La Flèche in Anjou, where he studied classics, logic, and Aristotelian philosophy, as well as mathematics from the books of Clavius. Descartes went on to obtain a degree in law from Poiter, then enlisted in the Dutch military. Military service was tradition in his family, and when the Thirty-Year War began he was encouraged to volunteer under the Count de Bucquoy in the Bavarian army. In his leisure time he studied mathematics, having been influenced by the Dutch mathematician and scientist Beeckman. Descartes is considered by many to be the father of modern philosophy, because his ideas departed widely from current understanding in the early 17th century, which was more feeling-based. While elements of his philosophy weren’t completely new, his approach to them was. Descartes believed in basically clearing everything off the table -- all preconceived and inherited notions – and putting back one-by-one the things that were certain, which for him began with the statement "I exist". From this sprang his most famous quote: "I think, therefore I am." problems" -- that is, problems that can be expressed through simple mathematical equations. The third section was intended to deal with "imperfectly understood problems," problems too complex to be reduced to an equation. Descartes hoped to show that even these problems could be expressed through mathematics. From 1620 to 1628 Descartes traveled through Europe, moving from Bohemia, to Hungary, Germany, Holland and France. In 1628 he met Cardinal de Berulle, the founder of the Oratorians who was impressed by his conversation with Descartes, and he encouraged Descartes to devote his life to the study of truth. In 1629 Descartes moved to Holland where he would live in seclusion for 20 years. During his first four year in seclusion he wrote Le Monde, a thesis on physics defending a heliocentric view of the universe. 1633 was the year that Galileo's Dialogue was condemned by the Catholic Church, and although Descartes’ book was ready, he put off its publication out of concern that his views might too be censured. The incomplete manuscript of Le Monde was finally published in 1664. 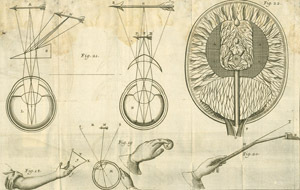 In 1637 Descartes published Optics, Meteorology, and Geometry -- a collection of essays. The preface to the collection is titled Discourse on the Method of Rightly Conducting the Reason and Seeking Truth in the Sciences, and was written (for the most part) before 1633. The work from these years forms the basis of some of Descartes most important contributions to mathematics and physics, including the introduction of what is now known as analytic geometry. One of Descartes' most enduring legacies was his development of Cartesian or analytic geometry, which uses algebra to describe geometry. He invented the convention of representing unknowns in equations by x, y, and z, and known’s by a, b, and c. He also pioneered the standard notation that uses superscripts to show powers or exponents. He was first to assign a fundamental place for algebra in our system of knowledge, and believed that algebra was a method to automate or mechanize reasoning, particularly about abstract, unknown quantities. Of the Real Distinction between the Mind and the Body of Man. 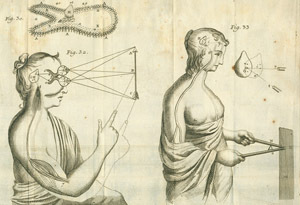 In Meditations, Descartes argues that the mind and body are distinct substances. He writes that humans are spirits, and that their essential attributes are exclusively of the spirit (for example thinking, willing, and conceiving). The human spirit occupies a mechanical body, made up of extended substance. Attributes like sense perception, movement and appetite are of the body and not the spirit, so they do not comprise human essence. Meditations was published in Latin 1641, and translated into French in 1642.
shifting the debate from "what is true?" to "of what can I be certain?" Descartes shifted the authoritative guarantor of truth from God to humanity. (While the traditional concept of "truth" implies an external authority, "certainty" instead relies on the judgment of the individual). In an anthropocentric revolution, the human being is now raised to the level of a subject, an agent, an emancipated being equipped with autonomous reason. "Thus, all Philosophy is like a tree, of which Metaphysics is the root, Physics the trunk, and all the other sciences are the branches that grow out of this trunk, which are reduced to three principal branches, namely, Medicine, Mechanics, and Ethics. By the science of Morals, I understand the highest and most perfect which, presupposing an entire knowledge of the other sciences, is the last degree of wisdom." In 1644 Principia Philosophies was published in Amsterdam. In its four sections, titled "The Principles of Human Knowledge", "The Principles of Material Things", "Of the Visible World" and "The Earth", are the study of mechanics, and developing a mathematical foundation of the universe. The book concentrates on physical science, specifically the laws of motion and theory of vortices. In 1647 the French court granted Descartes a pension to honor his work. Perhaps Descartes' most well known philosophical ideas are his "method of hyperbolic doubt", and the idea that though one may doubt, one may not doubt that one exists. The method of hyperbolic doubt is the refusal to accept either the authority of previous philosophers or information gleaned from one's own senses. He decided that in developing a foundation for philosophy anything that might be doubted must be rejected. Only what is beyond doubt is acceptable and may lead to truth. He finds that all that remains is the fact of doubting itself, and that something must exist to doubt, namely the philosopher himself. Descartes always refused the Aristotelian and Scholastic traditions that had been the dominant shape of philosophy throughout Medieval times, and he rejected religious influence in his scientific and philosophical studies. Descartes is considered a revolutionary figure, especially for his attempts to change the relationship between philosophy and theology, and integrate philosophy with the new forms of science. Descartes has been influential to philosophers throughout the 16th and 17th centuries, including Spinoza, Malbrache, Locke and Leibniz. In 1649 Descartes moved to Stockholm to tutor Queen Christina in philosophy. The work, combined with the harsh climate, had ill effects on Descartes' health. He died of pneumonia in 1650. Despite his attempts to stay on the church’s good side, Descartes’ books were placed on the Index of Prohibited Books after his death, so for years no Catholic was allowed to read them.